Officials representing Russia, Turkey, and Saudi Arabia appear to have doubts about remaining in the Paris climate accord, a senior Trump administration official told reporters at the G-20 summit at Buenos Aires on Dec. 1. 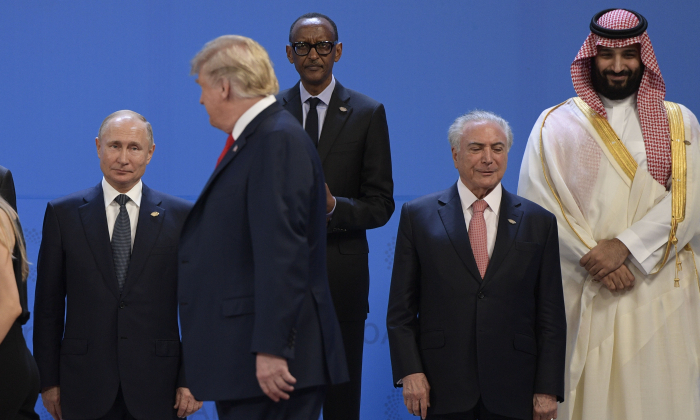 The official made the remarks after the leaders of 20 nations signed a declaration (pdf) that includes a passage reiterating that the United States is withdrawing from the Paris Agreement. The portion of the declaration dealing with the climate caused the most contention among the parties and was the last to be settled, according to the official. President Donald Trump withdrew the United States from the Paris climate agreement in June 2017. Russia and Turkey are signatories on the agreement, but have not yet ratified it internally. Saudi Arabia ratified the agreement in November 2016. The G-20 declaration states that the signatories of the climate accord “reaffirm that the Paris Agreement is irreversible and commit to its full implementation.” That point is followed by a rebuke from the United States. “The United States reiterates its decision to withdraw from the Paris Agreement, and affirms its strong commitment to economic growth and energy access and security, utilizing all energy sources and technologies, while protecting the environment,” the declaration states. Saudi Arabia and Russia are now the world’s second- and third-largest oil producers after the United States became the world’s largest oil producer in August. Russia’s Minister of Natural Resources and Environment, Sergei Donskoi, told the Sputnik News Agency last year that America’s exit from the climate accord will not impact Russia’s plans to ratify it. Donskoi said Moscow would make a ratification decision no earlier than January 2019. Turkish President Recep Tayyip Erdogan told the G-20 summit leaders in 2017 that Turkey is unlikely to ratify the agreement because Washington’s exit jeopardizes compensation promised to developing countries. Saudi Arabia was committed to the deal in 2017, promising to make changes in line with its economic reform agenda designed to wean the country off oil. No other country joined the United States in exiting the accord, but the senior administration official’s comments indicated that this may change. “We preserved our position. I think we explained it. And again, I think our message was resonating in the room, because that was the last issue to close, and there were other countries who are thinking long and hard about whether they still wanted to remain committed to that paradigm,” the official said. President Barack Obama signed the agreement in September 2016. The Obama administration made an individual commitment (pdf) to the climate accord to reduce greenhouse gas emissions by 26–28 percent below 2005 levels by 2025. According to a report by the Heritage Foundation, if the United States abided by its commitments through 2035, the country would lose 400,000 jobs, an average family of four would lose $20,000 in income, and household electric bills would go up by 13–20 percent. In total, the country stood to lose $2.5 trillion in gross domestic product, according to the report. On Dec. 3, world leaders gathered in Katowice, Poland, for what is billed as the most significant climate conference since Paris. Delegates from nearly 200 nations debated on how to achieve the goals of the climate accord. Representatives from some of the world’s most powerful countries were absent from the summit. “The wave of optimism and global cooperation that carried us to and through Paris has now crested, broken, and is now tumbling,” he told delegates. Notice: The headline has been updated to more accurately reflect the official statement.